Camp Walkabout is a place for fun and adventure, challenge and learning, for being in a safe environment to take risks, to get dirty, soaked, and scraped, all while laughing with new friends in exciting places. No experience is necessary, just an enthusiastic attitude, an adventurous spirit and a willingness to try new things. 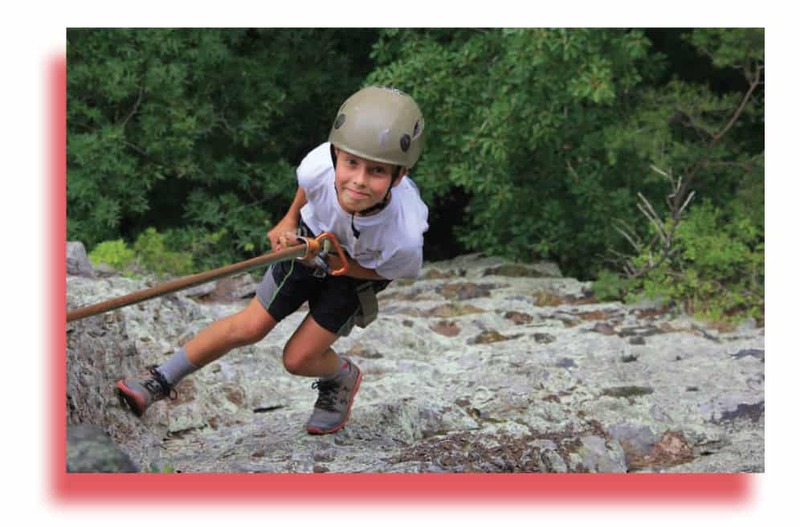 Whether it be canoeing through the Tennessee River Gorge, playing in hidden waterfalls, rock climbing Chattanooga’s famous T-Wall sandstone with pristine views, or just sleeping under the stars for the first time, the area surrounding The Baylor School is a playground for all things fun and adventurous. Camp Walkabout is designed to expose campers to a wide variety of outdoor activities in a fun, supportive environment, so that they may naturally gravitate toward what interests them most, and build skills with personal attention from experienced Walkabout instructors. 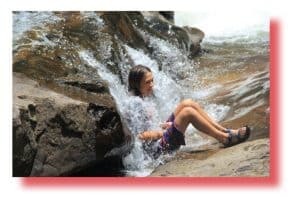 Campers may find themselves climbing a rock face in the heart of the Tennessee River Gorge one day, canoeing on the Hiwassee River the next day, then hiking to a remote waterfall for an afternoon swim the day after that. These daily activities will include paddle boarding, climbing, kayaking, canoeing, caving, hiking, swimming, rappelling, and much more. Campers will have the chance to try their hand at everything, rotating through each activity in small groups with a 1:3 staff to camper ratio. Camp Walkabout is designed to expose campers to a wide variety of outdoor activities in a fun, supportive environment. Each day’s activity will end by late afternoon, unless of course you’re on one of your overnight camping adventures. This time after daily activities will give campers a chance to explore their own individual interests. It could be a time to learn to roll a kayak in the pool, practice your moves in the climbing gym, or perfect your balance on the paddle board. It could be spent learning how to cast a fly rod or learning how to start a fire using nothing but sticks. Or for the athlete who can’t bear the thought of going two weeks without some practice on the field or on the court, this is a time each day to do just that and more. What would camp be without the evening games? This is the time for camp-wide fun, from capture the flag, dodgeball, and canoe fill-up, to scavenger hunts, frisbee golf, and relay races. Or it could be a game you’ve never even heard of! Some evenings will be planned, other evenings the campers will vote on what we do. But no matter what it is, this time is all about fun and using the last of the camp’s remaining energy. The possibilities are truly endless with all that Baylor’s campus has to offer. When the sun has set and the stars are out, when we are all tired and wet and dirty from a long day of fun, this is the best time to get everyone together to bring closure to the day. With the campfire blazing, students will enjoy wild stories from the local lore, songs from the musically-inclined staff and students, skits, dances, talent shows and much more. This is a time to be silly and laugh hard with your new friends before you head back to the bunks for the night. Sometimes being away from home for multiple nights can be difficult, and the right meal can make all the difference. We understand the connection between fun and food, and that’s why Camp Walkabout meals will be an important part of the experience. With Baylor’s dining hall as their culinary headquarters, campers will have a large variety of tasty, healthy options for the nights on campus. For those more adventurous evenings when you’re sleeping out under the stars somewhere, students will learn how to cook their own meals under close supervision – pizza, pasta, quesadillas, pancakes, omelets, and more. Parents should not be surprised to have their children come home and cook for them for a change. With the campfire blazing, students will enjoy wild stories from the local lore, songs from the musically-inclined staff and students, skits, dances, talent shows and much more. Without question, safety is the most important concern for any family considering a wilderness program, and it is equally important to us at Camp Walkabout. We aim to create an environment that allows campers to stretch their limits while managing the risk, and our commitment to risk management begins with our staff. Since we are all Walkabout veterans and Baylor alumni, we have the benefit of knowing their skills and talents because we trained them. We have followed their development as leaders, outdoor professionals and mentors since they were young, and we know their own personal approach to instruction and risk management. Still, all staff participate in an extensive staff training at the beginning of the summer, and every activity will be led by certified Wilderness First Responders – an 80-hour course in wilderness medical training. Challenge builds character. More than just teaching students to climb or paddle, we instill in them values that will help them in everyday life – leadership, respect, communication. We build on the NOLS pillars of “Expedition Behavior” (Or “EB”) to send home campers that are more aware of their fellow man and the beautiful places we use to recreate. Camp Walkabout truly is the most fun a camper can have in the summer! Bett Adams, Diretor of Camp Walkabout, has worked with Middle School aged students in all aspects of outdoor education, but in the end he’s just a kid at heart who loves the fun and adventure that can only be experienced through summer camp.